There certainly has been no shortage of iPhone 5 rumors over the past six months of so. And so many of the iPhone 5 rumors have been nothing but rehashed content and speculation, with little to no substance. But what if there was an iPhone 5 video that showed you futuristic concepts of what the next iPhone 5 could possibly do? Yeah, it would be the coolest iPhone 5 rumor video on the web. The features presented in the iPhone 5 video below show some amazing concepts. 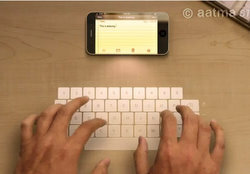 Features like a laser powered keypad for your iPhone – just swipe your hand downward and a full size keyboard appears for you to type one. Holographic video screen will turn your iPhone into an instant movie projector. And of course, the popular ultra-thin iPhone design.